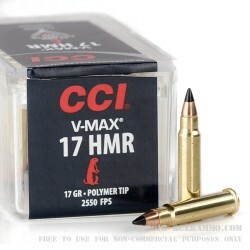 This 17 HMR cartridge by CCI features a 17 grain V-Max projectile. Crafted by Hornady, the V-Max is specialized for varmints and sports a hard polymer tip that shields its hollow point, significantly increasing its accuracy and ballistic coefficient. When that plastic tip gets pushed in on impact, the bullet mushrooms out for practically explosive damage. The V-Max bullet’s lead core has been swaged, a process that lessens the bullet’s impurities for more uniform performance as well as promoting its expanding capabilities. 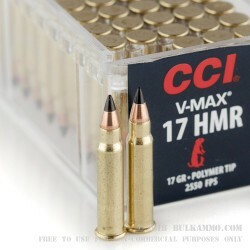 Long story short, this cartridge is the ground squirrel’s version of the boogeyman -- and coyote are no more fond of it. 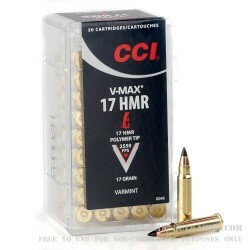 This rimfire brass cased cartridge offers a muzzle velocity of 2,550 fps, so it will register a good sound but leave little time for targets to react to it. 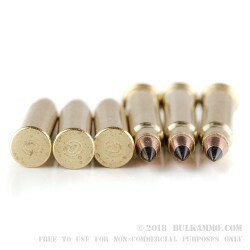 With 2,000 of these rounds for your rifle, your property will be free of varmints for quite some time.